There's a new budget maestro in town in the form of the Nokia Lumia 530, and we've got some amazing deals - but they won't last long so you'll have to be quick. These deals have just arrived and will be available for a limited time - they're a great chance to grab the phone for a lower cost that usual, so if you're in the market for a Nokia Lumia 530 then make sure you click through as soon as possible... once they're gone, they're gone! We'll be updating this page very soon with even more great deals, but these are the best around to get you started. 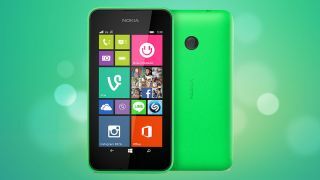 You can get yourself the Nokia Lumia 530 in green for free over at Carphone Warehouse, and you'll only have to stump up £12.50 per month for two years. That will get you 500 minutes, 5000 text messages and 1GB of data from TalkMobile, totalling just £300 over the life of the contract. If you need more than 1GB of data a month you can grab a black Nokia Lumia 530 with unlimited data and texts, plus 250 minutes for only £29.99 per month. The two year contract also gets you a free phone on T-Mobile and comes out at £719.76 all in. For those of you who don't like being tied down to a contract the Nokia Lumia 530 is also available SIM-free. In fact you can get it for just £89.95 in your choice of black, orange or green (the latter is still on pre-order) at Carphone Warehouse.